Life’s pretty bad. And then there’s your mom. Hollywood actress Suzanne Vale (Meryl Streep) seemed to, at one point in her career, have it all, but now, it seems like she’s about to lose it all. Now that she’s out of rehab and recovering from a very public drug-addiction, she hopes to get better so that she can continue to work and make all sorts of money again like she’s used to doing. But it is recommended by those who know best that she stay with her mother, famed actress Doris Mann (Shirley MacLaine), who has become a somewhat champion drinker herself. Now, more than ever, not only does Suzanne struggle with her sobriety, but she’s also got to struggle with getting along with her mom and accepting her for all the flaws and faults that she is, underneath the whole glitz and glamour of the career she once had and still receives praise for. So yeah, if you don’t know, Postcards from the Edge is an adaptation of Carrie Fisher’s autobiography, which is about her own battle with drugs, stardom, booze and yes, her famous mother, Debbie Reynolds. Knowing that, the movie definitely takes on a more interesting and darker spin; after all, watching someone famous, play another famous person who is literally telling their heartfelt, mostly true story, seems a little odd. It makes you wonder why they didn’t just hire Fisher and Reynolds in the first place and call the thing a day, right? After all, they seemed to get along so well in the first place, so why wouldn’t they be up to the task to begin with? Regardless, the movie still works. 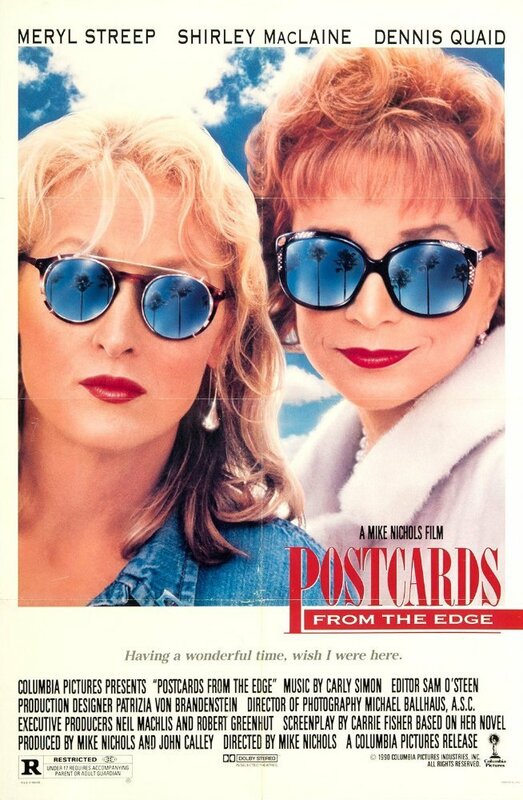 Oddly enough, Postcards from the Edge actually works best in the performances, mainly, those of Streep’s and MacLaine’s. Streep is especially great here because you get the sense that she’s not trying to get us to love her, or better yet, sympathize with her – the movie doesn’t ever seem to get as dark, or as mean as it should, but the very few instances of actual rawness comes through Streep’s portrayal of Vale/Fisher. Just by watching how she interacts with those around her and seeing as how she’s practically pushed to the side of everywhere she goes, all because of a troubled and checkered past, well, is pretty sad to watch. Streep plays it well though, never demanding sympathy and makes this person all the more realistic. And then there’s MacLaine who seems very much in her element here. Playing an aging dame of an actress, MacLaine gets to enjoy herself, occasionally vamping it up, but always coming back down to reality, reminding us that she’s a grade-A actress who can go head-to-head with Streep any day of the week. Together, they’re the perfect mother-daughter combination, and it almost makes you wish the movie was a smaller, much more contained piece and just focused on them, their relationship, and where exactly they’re going to go from here. Of course, though, we don’t get that movie. The movie we do get, in fact, seems awfully concerned with so much else. Mike Nichols always seems to have a general idea of what he’s doing with the material he’s working with and you’d expect from him, a much more emotional, rewarding experience, but the movie doesn’t seem to get all that close to the true emotions that an autobiographical story such as this could evoke. Most of this has to do with the fact that the movie seems to take on a whole lot more than it can actually chew, let alone, swallow; there’s Vale’s career, her relationship with her mom, her mom’s career, her experiences on movie-sets, her trying to nail parts in major Hollywood productions, her trying to maintain a steady relationship, her trying to stay sober, her trying to stay alive, etc. Eventually, you get the picture and unfortunately, that’s why a good portion of Postcards feels muddled. It takes on a lot, seems to have so much to say, but when all is said and done, it’s just too much. The Hollywood stuff is funny, but it’s not really new or groundbreaking; the relationship stuff with the mother gets developed enough; all of Vale’s career plots sort of work; her drug-addiction never gets nearly as descriptive or as eye-opening as it should; and although it’s always great to see Dennis Quaid, you take him out of this movie and guess what? It keeps on going. Still, though, there’s a part of me that’s glad a movie like Postcards exists, because it does paint a cynical portrait of Hollywood that we do see often, but still need to be reminded of. The idea that Vale’s career was already dying because of her age, and maybe less about her drug/alcohol addiction, is interesting as we still see it in today’s day and age of film. Of course, having Street play the role is interesting, considering the woman probably gets every role she ever shows any interest in, but still, there’s something to be said about a business that openly discriminates, gets away with it, and continues to live long and prosper. Maybe something needs to change, eh? Consensus: With two very good performances in the leads, Postcards from the Edge is an interesting tale of family, but never goes any deeper than it probably should have beyond that. Solid review Dan. I had forgotten this was a movie that existed, and now I think I am going to give it a look. Thanks! I never caught up with this. Will have to give it a shot someday, but not for awhile, for obvious reasons. I cannot believe this past week.